Ever wonder why certain issues continue to reoccur in your life? Do you experience deja vu when around certain people, places, and things for the first time? The answers to these current-life mysteries may be found in our past lives. 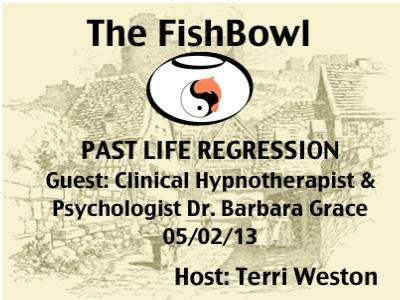 Advanced Clinical Hypnotherapist, Ordained Minister, and Psychologist Dr. Barbara Grace joins Terri Weston to discuss the power of knowledge discovered through past life regressions. Learn * the facts and myths about past life regressions * how to get to the roots of underlying fears, quirks, desires, and habits * how to access and apply the wisdom from our past lives on a daily basis * how even someone who does not believe in past lives can benefit from the process. For more info visit www.intothefishbowl.com.